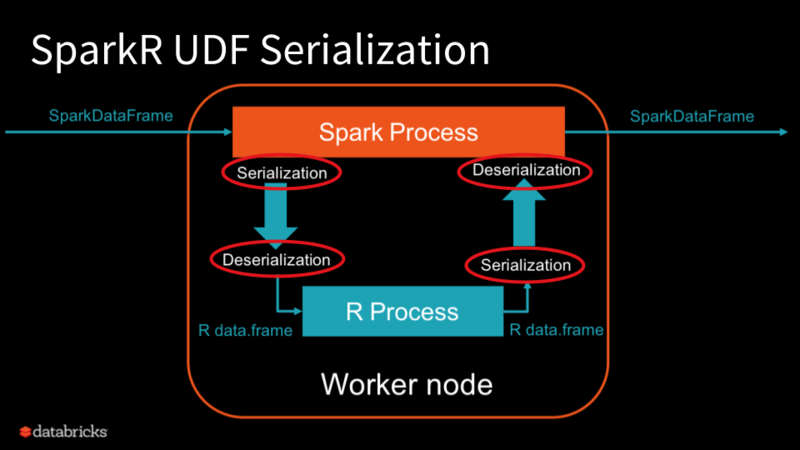 SparkR User-Defined Function (UDF) API opens up opportunities for big data workloads running on Apache Spark to embrace R’s rich package ecosystem. 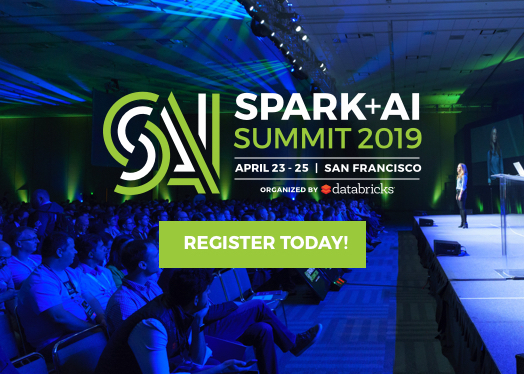 Some of our customers that have R experts on board use SparkR UDF API to blend R’s sophisticated packages into their ETL pipeline, applying transformations that go beyond Spark’s built-in functions on the distributed SparkDataFrame. Some other customers use R UDFs for parallel simulations or hyper-parameter tuning. 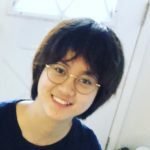 Overall, the API is powerful and enables many use cases. 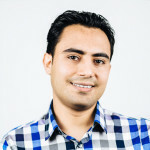 SparkR UDF API transfers data between Spark JVM and R process back and forth. Inside the UDF function, user gets a wonderful island of R with access to the entire R ecosystem. But unfortunately, the bridge between R and JVM is far from efficient. It currently only allows one “car” to pass on the bridge at any time, and the “car” here is a single field in any Row of a SparkDataFrame. It should not be a surprise that traffic on the bridge is very slow. 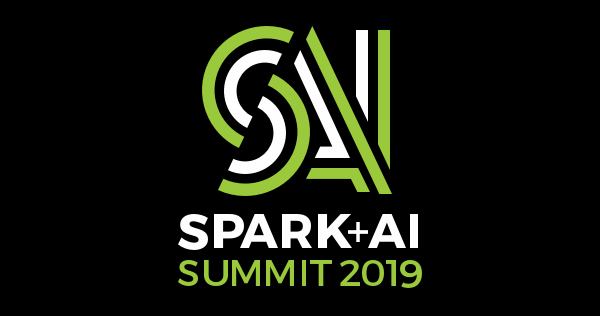 In this blog, we provide an overview of SparkR’s UDF API and then show how we made the bridge between R and Spark on Databricks efficient. We present some benchmark results. 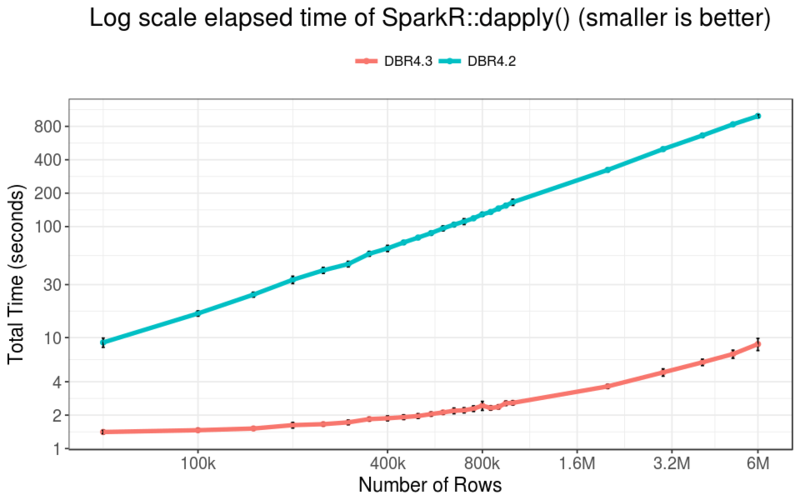 dapply() allows you to run an R function on each partition of the SparkDataFrame and returns the result as a new SparkDataFrame, on which you may apply other transformations or actions. gapply() allows you to apply a function to each grouped partition consisting of a key and the corresponding rows in a SparkDataFrame. dapplyCollect() and gapplyCollect() are shortcuts if you want to call collect() on the result. The following diagram illustrates the serialization and deserialization performed during the execution of the UDF. The data gets serialized twice and deserialized twice in total, all of which are row-wise. 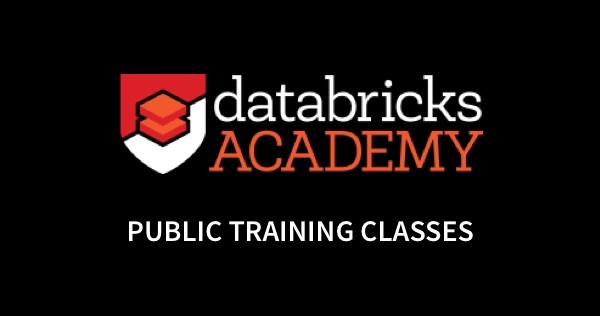 By vectorizing data serialization and deserialization in Databricks Runtime 4.3, we encode and decode all the values of a column at once. 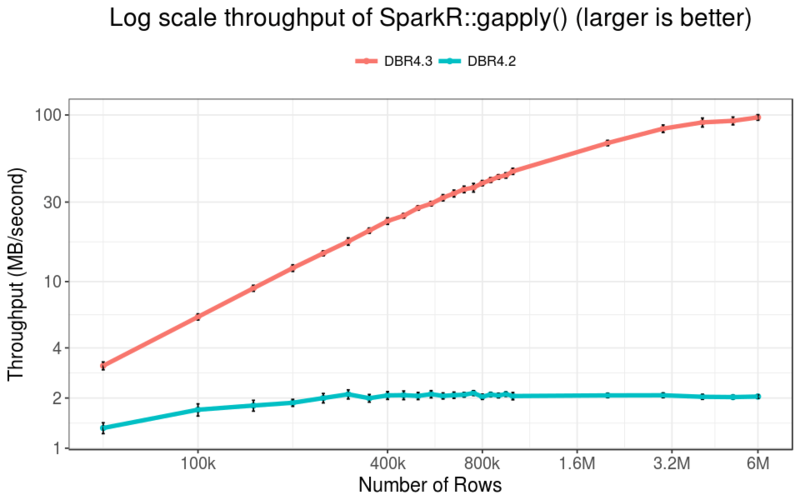 This eliminates the primary bottleneck which row-wise serialization, and significantly improves SparkR’s UDF performance. Also, the benefit from the vectorization is more drastic for larger datasets. We use the Airlines’ dataset for the benchmark. The dataset consists of 24 integer fields and 5 string fields including date, departure time, destination and other information about each flight. 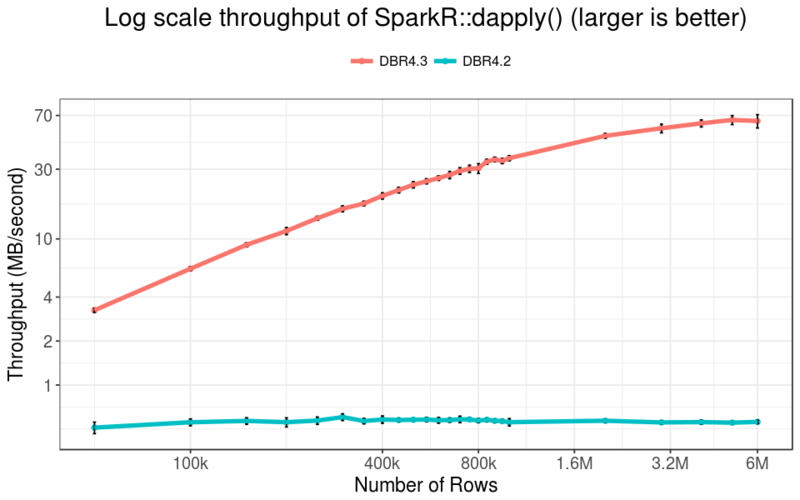 We measure the running time and throughput of SparkR UDF APIs on subsets of data with varying sizes on both Databricks Runtime (DBR) 4.2 and Databricks Runtime 4.3, and report the mean and standard deviation over 20 runs. DBR 4.3 includes the new optimization work, while DBR 4.2 does not. All the tests are performed on cluster with eight i3.xlarge workers. 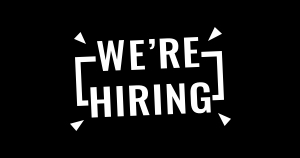 To demonstrate the acceleration, we use a trivial user function with SparkR::dapply() that simply returns the input R data.frame. Overall, the improvement is one to two orders of magnitude, and increases with the number of rows in the dataset. For data with 800k rows, the running time reduces from more than 100s to less than 3s. The throughput of DBR 4.3 is more than 30 MB/s, while it is only about 0.5 MiB/s before our optimization. For data with 6M rows, the running time is still below 10 seconds, and the throughput is about 70 MiB/s — that is 100x acceleration! 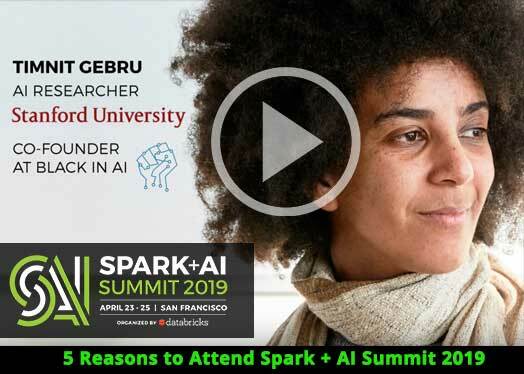 In practice SparkR::gapply() is more frequently used compared to dapply(). In our benchmarks, we removed the shuffling cost by pre-partitioning the data by the DayOfMonth field, and using the same key in gapply() to count the total number of flights on each day of month. 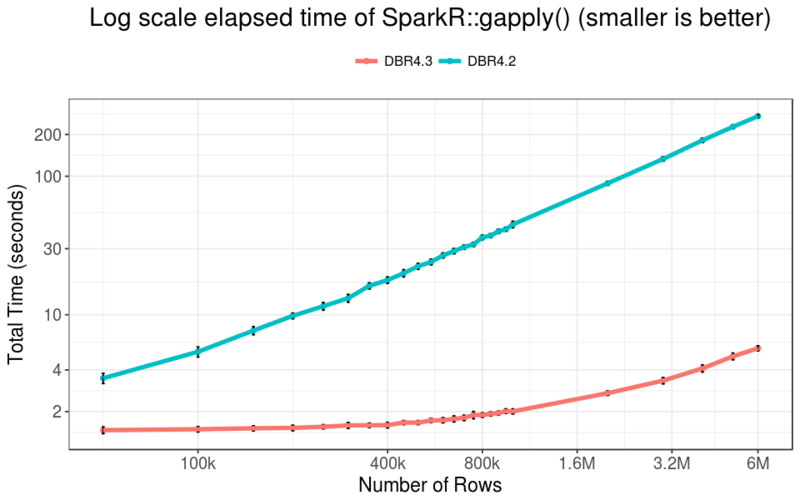 In our experiment, gapply() runs faster than dapply(), because the output data of the UDF is the aggregated result of the input data, which is small. Thus the total serialization and deserialization time could be halved. In summary, our optimization has an overwhelming advantage over the previous version on all ranges of typical data sizes, and for larger data, we observed one to two orders of magnitude improvement. Such significant improvement can empower many use cases that were barely acceptable before. Also, Date and Timestamp data types are now supported in DBR 4.3, which had to be cast to double in the previous version.